Watch out drones, Starbucks will soon begin delivering right to your desk. Starbucks delivery. Pumpkin spiced lattes right to your mouth, no movement necessary. In 2015, the coffee giant will launch its new mobile-payment app allowing customers to order without waiting in line. Latter next year, they are plan on making food-and-beverage deliveries in select markets. Delivery will only be available to loyalty-program members though, but who isn’t going to become one after this news? Starbuck’s CEO Howard Schultz believes delivery and mobile payment will be “E-commerce on steroids”. Forrester Research estimates that the mobile payments market in the U.S. will reach $90 billion by 2017 with restaurants like Taco Bell and Wendy’s already launching their own mobile apps. As if people weren’t staring at their phones enough. By adding mobile payment and delivery, Starbucks is totally quenching consumer thirst for new technology. But this might come with some risks. Many of Starbucks’ drinks are temperature-sensitive. With time for delivery, an iced drink could arrive watered down, and a hot one could arrive lukewarm. And what about the coffee shop culture: the free WiFi, the hipster barista, the quirky name spelling on the cup. Oh, and, my favorite, listening to people place orders. If only there was a way for Starbucks to deliver intravenously…. Someone tell them to get this idea brewing. Starbucks is pouring beer-flavored latte. Eew. Totally sounds gross to me. This new dark barrel latte from Starbucks is an experiment in flipping the script on coffee-flavored beers. Coffee-flavored beer has existed for ages. Whichever local microbrewery is nearest you likely has some sort of coffee stout. It’s a flavor profile with proven staying power…for beers. How would you feel if the script was flipped, and instead of a coffee-flavored beer, you were drinking a beer-flavored coffee? That’s the selling point of Starbucks’ new Dark Barrel Latte, which is based on the rather insane concept that people over the age of 22 want beer for breakfast. The beverage – which is non-alcoholic, for the record – is geared to taste like a Guinness-type stout. I don’t know about you, but the last thing I want my morning coffee to taste like is beer of any kind. I was schlepping through grocery store the other day and saw cappuccino-flavored potato chips. Now I see that Starbucks is creating beer-flavored coffee. Can’t we just let things taste like they taste? If I want a mocha, I’ll order a mocha instead of eating mocha chips. Same thing applies to this new beer-flavored coffee. Enough is enough. I’m officially declaring war on anything that is artificially scented or flavored to taste like a completely different food or beverage. I just don’t get it. Not to mention the fact that I can’t help but wonder what sort of crazy chemistry went into making coffee taste like beer. Bottom line: If you’re the kind of person who needs your morning kickstarted by the flavor of beer, you probably have a problem that requires professional help. The kind that Starbucks can’t provide. 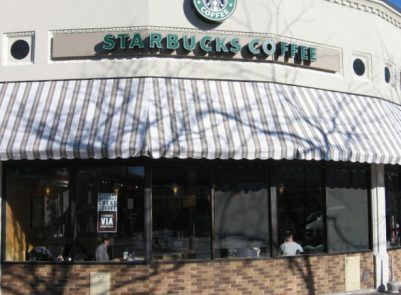 Last week police removed a man from the Arlington Center Starbucks (in Arlington, MA) for alleged huffing. Seemingly a venti mocha cappuccino wasn’t enough to get the anonymous Arlington man through the day. So instead of adding a couple of shots of espresso to his coffee he decided to sniff from two bottles of keyboard “dust off” (apparently he couldn’t get his hands on any glue). Huffing is the colloquial term used to describe the sniffing of intoxicative inhalants. The fumes cause a slew of side effects, including light-headedness, dizziness, incoherence and involuntary loss of muscle control. While some might find these symptoms reminiscent of a bad case of the flu, others actually enjoy the high. However, if you’re planning on huffing you should probably do it within the privacy of your own home. As the Arlington Starbucks huffer has learned, sniffing from bottles in broad daylight in a crowded public place does, indeed, attract attention. A Starbucks manager noticed the man’s odd, erratic behavior and his bottles of dust off and promptly called the police. While the man was not arrested, the police did give the man a verbal no trespass order and encouraged him to seek out help for his problem. I guess the huffer left the shop in a huff.